I bought my Taurus in December 2015 just before retiring from my industrial boiler job of 38 years. I've always been a car enthusiast and the Deep Impact Blue Bull is a real eye-catcher. Just for info sake, "Bonnie the Ghosthawk" was a heavily modded 2004 Pontiac Bonneville and "Maggie the 21st" (so named by my grand-daughter) was a 2005 Dodge Magnum R/T. Here is the pic of the day I took delivery...let the games begin! sheila and DoctorHugocat like this. The first wash-n-shine pic after the Taurus came home. Note the "BRUUSER" license plate. Many of us name our cars, and I fall into the category, but sometimes it takes a while for the connection of personality to make itself known. "Bruuser" came from the idea of a black-n-blue color theme which shadows the police cruiser image. I'm also a big Batman fan which is where the "BatCruzer" came from in the sig pic. Hunting for that just right name is one thing, but I knew a decklid spoiler was a must-have addition. I've added aftermarket wheels/tires to just about everything I've owned. My original plan was to equip the stock rims with winter tires since this car is my daily driver, but winter in Virginia is seldom severe enough to justify the swap. I ran across these XXR531s in 19x8.5 for $149ea and though it would play well with the black-n-blue theme. The longer I looked at the new wheels the more I knew that stock grille had to go. I considered many options, and was leaning strongly toward the Interceptor unit, but the more I looked at the factory SHO piece the more I knew it was what I wanted. The chrome surround, tighter mesh grille weave, and a bolt-on/no fuss install sold me against the higher cost. I also knew after looking at this pic that some kind of hood treatment was in my future. Just what that was I had no idea at the time. From the time I bought the car I was impressed with the growling intake noise it made. Its unusual for a stock anything nowadays to produce an aggressive note, and I love the song of a naturally aspirated engine vs the force-fed variety. I was very interested to find out how much an intake kit would wake the car up. The one I installed on my convertible really made a change in the high revs and much the same was true here. MPG didnt suffer, acceleration was seamless despite the built-in throttle blips (to save trans wear I assume) and the full-throated roar is tremendous! I've stuck with K&N kits for more than a decade, and while the cost hurts a little on purchase, I thank myself when I do the install. I love it when things fit like they belong and work like they should. I've yet to run across a K&N kit that didnt blot-on without a hitch. Once the intake was in place then I had to move on to the exhaust. Like the intake, the muted exhaust note was nice but needed the volume turned up a few notches. I opted for Summit Racing Fully Welded Mufflers (basically their version of a Flowmaster) and some 4in OD stainless tips that kept with the slash cut look of the stock pipes. The intake and exhaust together now make a wonderful mix of horsepower music! At this point the car had been on several road trips, and while I was happy with it for the most part, I knew I wanted it to have a more distinctive attitude. Some may recognize the car below from a test on Top Gear. The Vauxhall VXR8 Bathurst Edition. The Bathurst race in Australia is not only a grandaddy event, but the ultimate clash of Ford vs General Motors. The Aussie version is the Holden Commodore which squares off against Ford's weapon of choice, the Falcon XR6. While the Taurus will never be offered with V8 or RWD, the shared styling cues are unmistakable. The Taurus enjoyed a short time in the sun as NASCAR's Ford representative, but little was ever done to promo a sporting image. I owned 1991 SHO (back in the day) and the SHO today is still a potent, capable performance machine, but its appearance has always been a muted theme. I realize I'm in a minority here, but I wanted a taste of that Aussie attitude. 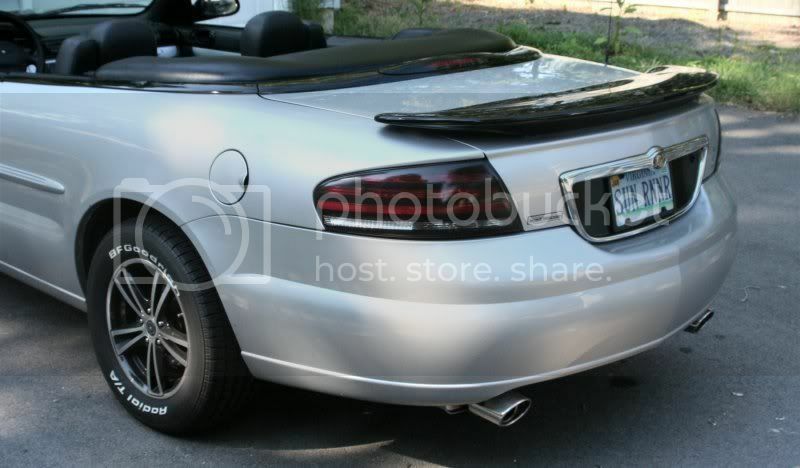 In my search for a more aggressive spoiler for the decklid (without going full-tilt/carbon fiber picnic bench) I ran across this picture of my old 2004 Chrysler Sebring convertible. 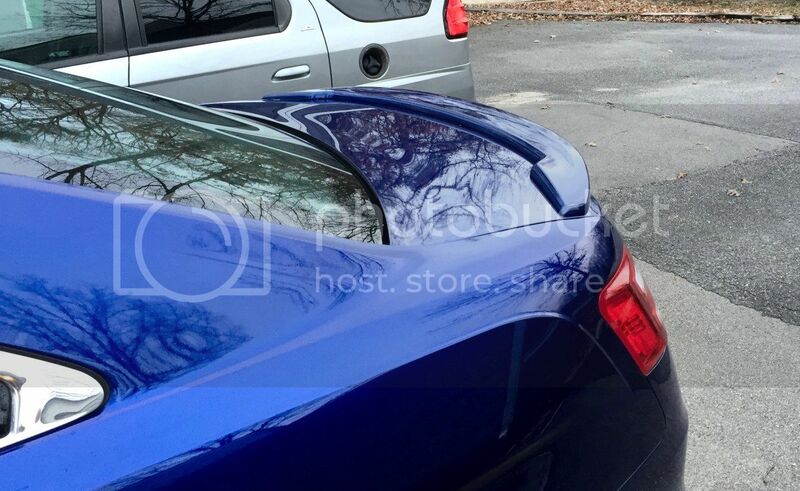 The black spoiler was actually the stock unit off my 2001 Grand Prix GT. I sat it on the trunk one sunny afternoon and was impressed with how good it looked. I picked up another spoiler on eBay for $49 and did a dry fit on the Taurus. The mount wasnt ideal but workable, and while I wish it was a bit wider over (so the ends would reach the fender edge rather than trunk edge) I'm quite happy with the result. I added Lund large one-piece car scoop, but almost immediately knew it looked too small. Last edited by Bruiser56; 05-11-2017 at 02:09 AM. I also love the ability to change the wallpaper on the SYNC screen. I've always been a big fan of little custom touches I've seen at car shows over the years. On high-end customs, name badges or personalized logos are often painted on to mimic factory pieces. On a lower budget, custom decals when tastefully placed make for neat touches that people take note of. I'll soon be changing the badging all around the car to match the wallpaper screen 'KnightOwl' but here is one of the center caps currently in place. The question I easily get asked most often is, "That a SHO?" I completely understand how many feel you shouldnt project the image of a performance car if it its the top-line performance model. I agree to the point that you shouldnt slap "SHO" badges on a Taurus that is not said model. 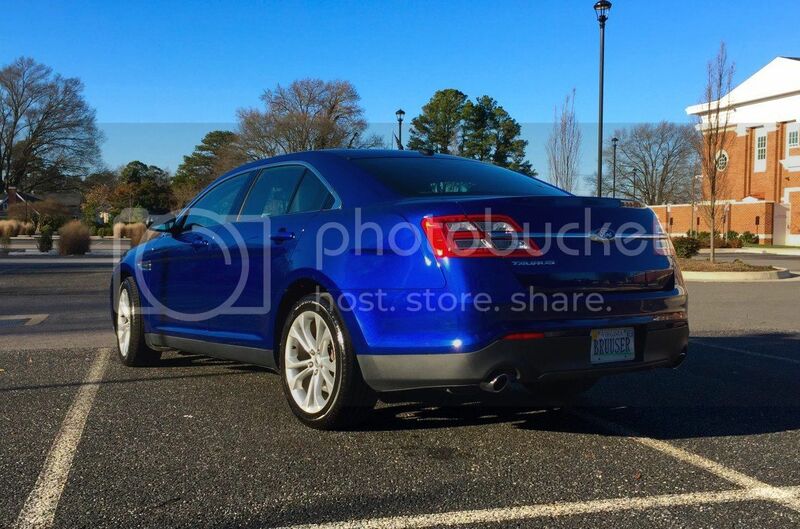 However, if someone wanted a sportier image from a 4cyl EcoBoost model, why should they be denied? The SHO is indeed a potent sedan, and I highly considered buying one but ruled it out for several reasons. First, this car was to be my daily driver and the car I traded was a top performance model (Hemi R/T) so I was not high on that idea at a greater cost. Second, the need for premium fuel. Superior performance always has its costs. If it were a playtoy my perspective might be different. The question was how badly did I want another 65hp? Third, and this is very much a personal choice, but I adore the sound of a naturally aspirated engine over a turbo-whoosh every single time. I'm not a big drag-racer, and if you visit a few road course track day events, you soon find that all-out horsepower is not required for huge fun and thrills. Good brakes, handling, and above all, your driving technique create amazing satisfaction for the motoring experience...and thats where my heart is with my car. A little track look feels right at home. red1302 and DoctorHugocat like this. The Knight Owl got a new set of talons! One of the Pirelli tires shifted a belt I think and began making a strong oscillating sound. Initially, I thought a wheel hub was going bad but I opted to try new tires first since other checks showed the hubs to be in good shape. The BFGoodrich Comp2 A/S meats are amazingly quiet for an aggressive rain tread pattern. They handle well, ride smooth, and deliver that meaty look I prefer. I wont be going back to the sidewall letters since they proved far more headache than the look was worth. Probably okay for a show car but not a daily driver.